“AVANT-GARDE: FROM THE FRENCH, ‘ADVANCE GUARD’ OR ‘VANGUARD,’ A TERM REFERRING TO PEOPLE OR WORKS THAT ARE EXPERIMENTAL OR INNOVATIVE, PARTICULARLY WITH REGARD TO ART, CULTURE AND POLITICS, A PUSHING OF THE BOUNDARIES OF WHAT IS ACCEPTED AS THE NORM OR THE STATUS QUO IN ORDER TO ACHIEVE SOCIAL, POLITICAL, ECONOMIC AND CULTURAL REFORM.” ADAPTED FROM WIKIPEDIA. I belong to a community driven by innovation and experimentation, one that doesn’t blindly accept what is, but what is necessary and why this is so to an arts community, which encourages a discourse of relevance using the artform as the platform for debate. I am an Indigenous interdisciplinary performance maker, born also into my Wiradjuri heritage where I have immediate and extended family obligations, but with a practice nurtured and consolidated within my contemporary community through my training at NAISDA (National Aboriginal/Islander Skills Development Association) Dance College. My passion to make work is driven by my continual thirst for knowledge about culture (Indigenous, mainstream, contemporary and ‘traditional’). I use it as another source of commentary for understanding as I learn and appreciate the complexity, sophistication and diversity of expression. My works do not always constitute singular linear narrative perspectives. 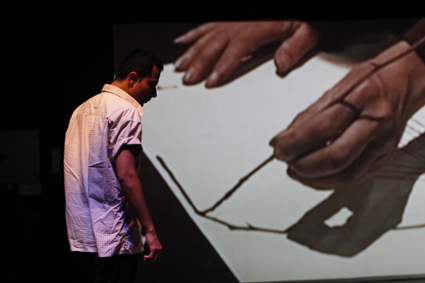 They often comprise episodic, abstract non-linear narratives that work to a concept: Wiradjourni (2006) was inspired by the Wiradjuri kinship system and choreographed to explain how it works as a complex mathematical equation through spatial floor patterns and with the use of a series of rhythmic structures. My Right Foot, Your Right Foot (2007) was inspired by ancient trade practices, the commercialisation of Aboriginal performance for the tourism market and Welcome to Country protocols, while Briwyant (2010, see review) was inspired by the inherent interdisciplinary nature of Indigenous cultural expression, including song, dance, story, painting and the bir’yun effect in Yolngu painting through crosshatched lines and the similar shimmer effect in desert dot paintings, which imbues them with ancestral magic, connecting us inextricably to [this] country. I utilise this knowledge to explore how these ancient practices may still manifest themselves in the present urban environment. I believe in cultural memory and that our culture is a living one, not boxed in by a preconceived notion of the ‘traditional’ being the only true authentic. In Briwyant this is illustrated through the tracking of country, my country being the streets of inner western Sydney, from the St Peters train station to an internet joint in Redfern. 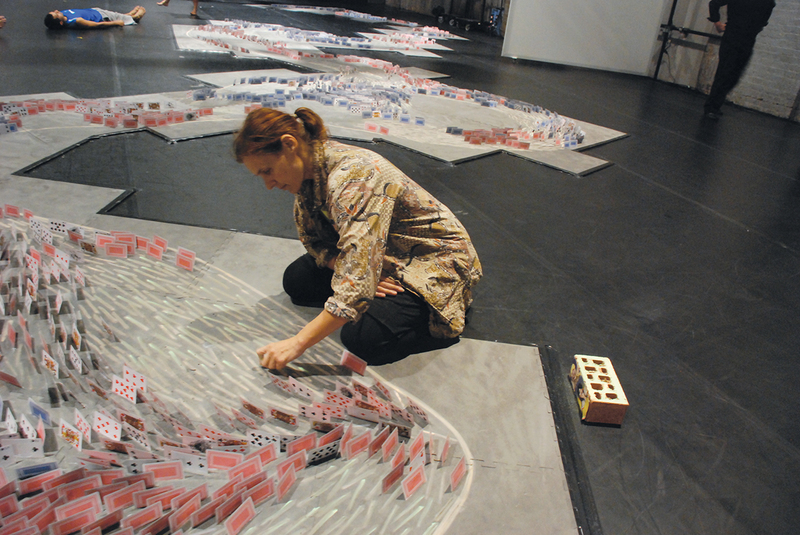 My set was adorned with an installation comprising a river of playing cards, each card a dot, representing the Lachlan River, while also alluding to the proliferation of wealth shared throughout communities through mini ‘casino’ gambling. In My Right Foot, Your Right Foot two dancers enact breaking into a house to steal a mobile phone, using an amalgamation of tracking/hunting steps to a voiceover from a novel titled I, the Aboriginal written in 1962 by Douglas Lockwood, who as a white Australian, wrote in first person as the first Aboriginal medic and senior lawman from Roper River. In this passage Lockwood describes going on a successful hunt for the first time. I wanted to illustrate the flipside to Welcome to Country ceremonies and comment on the possibility of wasted/neglected potential. My dance language is an amalgamation of my ongoing dance practice through continued contact with NAISDA (25 years to date) and mainstream contemporary dance training, learning dances from Turkey Creek, Christmas Creek, Maningrida, Mornington and Bathurst Islands, Yirrkala and Murray, Saibai, Moa and Badu Island to name a few, alongside jazz, tap, African American and classical ballet. This was underpinned by Graham-based modern training, which was consistent and predominant in order to both fast-track our dancers’ bodies and give us entry into modern ideologies of art. These styles manifest themselves equally in my choreography; from years of repetition I embody them, they in turn embody me. Not in a clear distinct linear fashion, whereby each unit of movement attributed to specific communities asserts itself individually, but as a new logic that only my body, and people who have trained as I have, understand. Our mid-year and end of year performances at NAISDA featured dances consisting of this new developing hybrid style, an Indigenous aesthetic not specific to one community but to us (Aboriginal and Torres Strait Islander students) as a collective. In my time I witnessed dances about black deaths in custody and the Stolen Generation; I performed in Parliament House and in protest for Survival day. We used our vocabulary as a tool for recognition of our living circumstances, to positively effect change. At the National Indigenous Theatre Forum in Cairns in August, 2012, it was suggested much more stringent measures must be put in place for usage of any cultural vocabulary requiring specific permissions from relevant communities. I always seek permission if using intellectual material from specific story and song cycles—information pertinent to the underpinning existence of a community. I ask myself whether I am compromising any community ethically and financially as a mandatory cautionary measure. The initiative proposed at NITF will prove a very difficult undertaking. But not only that, I think it is complicated and in some cases would be unnecessarily pedantic, inhibiting freedom of expression in places such as NAISDA and ACPA (Brisbane based First Nations college of performing arts). In my case I have an ongoing relationship with several communities due to my association with NAISDA (I am currently employed on a casual basis as technique and repertoire teacher). I invite my local community to watch works in all stages of progress. Most recently, my choreography for NAISDA, Imprint, containing deconstructed vocabularies from my Yolngu and Tiwi training, was performed at the Garma Festival in front of representatives and Elders of both communities to an overwhelmingly positive reception. I did not ask permission to utilise specific steps but instead relied upon my accumulated knowledge. I will shortly go to Galiwinku community on residency with NAISDA and will listen, watch and ask questions when the time is right, with my intuitive understanding of when that might be. What happens if I want to use my collective embodied knowledge to illustrate a non-specific Indigenous concept? What if I want to use my hybrid language to illustrate something unsavoury, unpopular or controversial? How do I explain the importance of absurdity? How do I ask permission if I want to challenge the way and setting in which my performance is framed? Martha Graham’s principles of contract and release, a ballet pas de bourrée, are commonly used in many dance contexts and we don’t ask specific permissions. I think a one-size-fits-all approach negates the capacity for individual integrity. As a contemporary artist I use my medium to provoke and to provide insight and possibility for change. Tradition reiterates long-held cultural practice, while contemporary practice is current in its immediacy. These ideologies are polar opposites but when compared or used in juxtaposition each gives the other context. I have witnessed this in the performances of Akram Kahn, the English-born Bangladeshi choreographer who utilises his Kathak dance to illustrate the contemporary human condition as he sees it, often pairing up with performers from other cultures as he did with Sidi Larbi Cherkoui in Zero Degrees where he utilised several dance languages, live spoken text and sculpture to illustrate his experience of going to India, looking like/having the same racial heritage as the locals but being British, he is an outsider, a tourist. I do know I rely heavily on my moral compass and that if something feels wrong or unjustifiable I need to keep talking to relevant community members until it feels right. I also know that my art often articulates the point that can’t be said with mere words and that after the work is seen the real talking proceeds. We, as Indigenous performance makers, are working within a new climate that acknowledges the importance of being the authors of our own works. We are in the perfect position to challenge the black box environment and explore how we, as an inherently interdisciplinary, expressive culture want to be seen/experienced. This cannot be done through tighter and tighter gate- keeping within our arts community, but rather through processes that acknowledge and encourage trust as well as communication. Vicki Van Hout is a Wirradjerri woman born in Wollongong on the NSW south coast. In the early 90s she moved to New York and trained with leading modern and post-modern dance artists before returning to Australia in 1996 to train at the National Aboriginal and Islander Skills Development Association and to perform with Bangarra Dance Theatre. 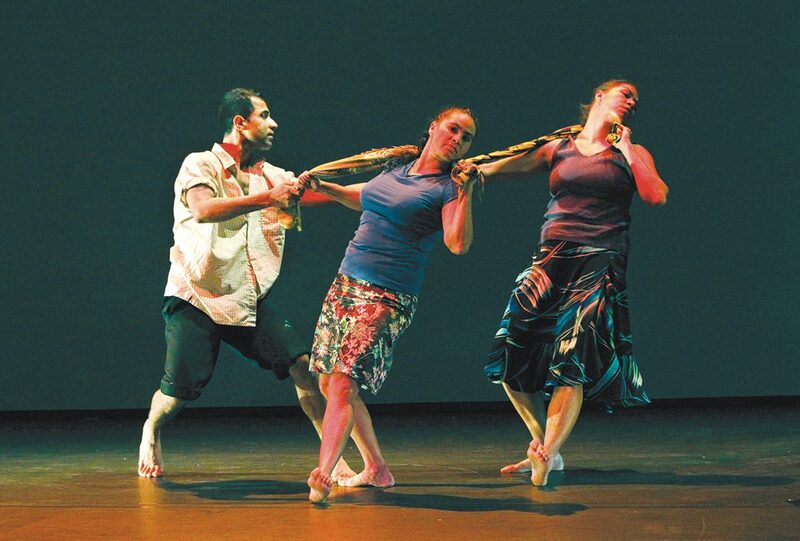 As well as creating her own work, including the nationally toured Briwyant, she teaches at NAISDA Dance College. Van Hout has recently received a grant from the Australia Council’s Indigenous Experimental Art Fund for a hybrid performance development workshop inspired by Long Grass People (homeless Indigenous people).